Ontos: "Death Was Already in the Room with the Two of Them"
"Death Was Already in the Room with the Two of Them"
"Dilemma of the Dead Lady." 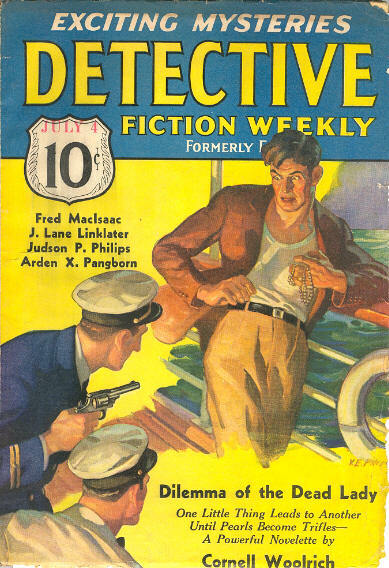 First appearance: Detective Fiction Weekly, July 4, 1936. 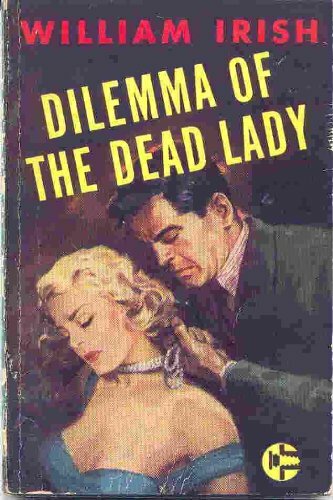 Reprinted in Detective Fiction, February 1951 and The Black Lizard Big Book of Pulps (2008); collected in Dilemma of the Dead Lady (1949) as by "William Irish." "The Instant Babe Sherman Became Desperate, He Began to Make Mistakes—Just Two Mistakes, but Either Could Cost His Life!" Chapter I: "He was a good-looking devil, if you cared for his type of good looks—and women usually did. Then later on, they always found out how wrong they'd been." 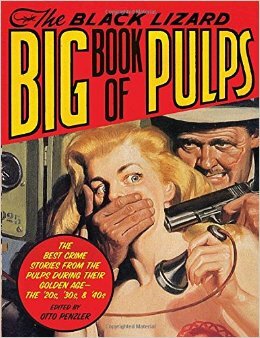 A running battle of wits develops between an unnerved jewel thief turned killer and the man who just won't leave him alone, with a violent, doubly ironic finish. "Get hep to yourself! I should marry you! Why, we don't even talk the same lingo!" "But you are going to New York! This ticket is for one!" "Lone wolf, I notice, though. Matter, Sûreté get your shill?" "Oh, purrdon me! We've got the President with us!" "He had a good reason, $75,000 worth of pearls. When they said it in francs it sounded like a telephone number." "She was staring, not at that, but at the lustrous string of pearls that spilled out of it like a tiny snake, their diamond catch twinkling like an eye." "Suddenly she dropped vertically, like a plummet, between his fumbling hands, twitched spasmodically for an instant at his feet, then lay there still, face black now, eyes horrible protuberances. Dead. Strangled by a thing of beauty, a thing meant to give pleasure." "Strangest of biers, for a little fool that hadn't known her men well enough!" "The driver had made the Gare like only a Paris driver can make a destination, on two wheels . . ."
". . . the ashes of a cigarette were the only obsequies she was getting." "He felt like someone who has just had a rattlesnake dropped down the back of his neck while he's tied hand and foot." "Water scotches a trail in more ways than one." "Something inside him curled up, but because there was no blade or voltage to follow the shock, he went ahead breathing and thinking." "Then one of those hunches that at times visit the deserving and the undeserving alike, smote him from nowhere . . ."
"A minute later she was out there with him, and the end of his long, harrowing purgatory was in sight." "His face was a piteous blur against the night that would have wrung tears from the Evil One himself." "There was a rush of blood to his ears that drowned it out, and the laughter of the Furies seemed to shriek around him while they prodded him with white-hot irons." Typos: "three time over"; "the coffe in Paris."
. . . so many of his characters are shades of gray. People with whom we empathize choose to murder someone, or are put in positions where there seems to be no choice. Policemen, the upholders of the law, are frequently fascistic thugs who enjoy torturing suspects. Pretty girls with faces of angels turn out to be liars and cheats, and often worse. His situations ended unjustly when other authors would have resolved them neatly, and a Woolrich character often still faces a future barren of love, joy, or hope at the end of a story. The trick Woolrich plays on the reader in "Dilemma of the Dead Lady" is basically the one Alfred Hitchcock plays on the audience in some of his films—against his better judgment, the reader comes to identify with the villain. 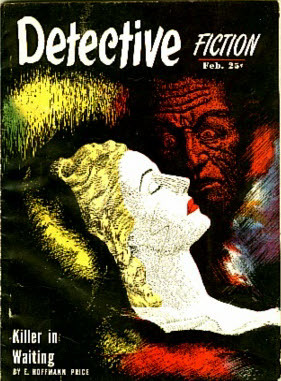 - Woolrich's detective fiction has been previously featured on ONTOS several times: HERE, HERE, and HERE. The bottom line: "I wear a necklace 'cause I wanna know when I'm upside down." "This Bandit Robs with the Law Behind Him"
"What's So Risky About a Hop to Venus?" "There Was Something About This Particular Cat"